Includes transportation from the Cruise Ship Tourism Village in Belize City, where you Tender off your ship. You will then get the 9:00 (BELIZE TIME) water taxi to Caye Caulker. We will meet you when you arrive in Caye Caulker, then take you to our office, then off on your Snorkel Adventure. You will Snorkel the Hol-Chan Park and Shark Ray Alley where you will see lots of Nurse Sharks, Sting Rays, Turtle, and an abundance of Marine Life. Then it is back to Caye Caulker where you can enjoy our beach, or walk around the island until you have to ferry back to Belize City to be tendered to your ship, the time you have depends on your ship. 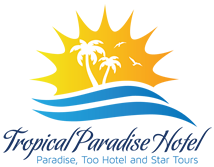 We include your water taxi transfer, water, fresh fruits, and your snorkel gear on this tour. Hol-Chan is our flagship Tour. Charters are available for ALL Cruise Ship Passengers. We can arrange very affordable charters for small or large families or groups. Contact us and we can customize a tour to suit your needs and demands. I'd like to receive emails, updates and newsletters from Tropical Paradise.